An honorand and the principal guest speaker at the 2007 Commencement exercises, Bill Gates reveled in collecting his Harvard degree—30-plus years after he dropped out of the College. Walter Isaacson ’74, a member of the Board of Overseers and biographer of Apple’s Steve Jobs and others, is writing a book about the great inventors of the digital era. He shared this section on the Harvard undergraduate years of Bill Gates ’77, LL.D. ’07, co-founder of Microsoft, who now runs the Bill & Melinda Gates Foundation. Gates returns to campus this weekend to participate in a Harvard Campaign launch event. It may have been the most momentous purchase of a magazine in the history of the Out of Town Newsstand in Harvard Square. Paul Allen, a college dropout from Seattle, wandered into the cluttered kiosk one snowy day in December 1974 and saw that the new issue of Popular Electronics featured a home computer for hobbyists, called the Altair, that was just coming on the market. He was both exhilarated and dismayed. Although thrilled that the era of the “personal” computer seemed to have arrived, he was afraid that he was going to miss the party. Slapping down 75 cents, he grabbed the issue and trotted through the slush to the Currier House room of Bill Gates, a Harvard sophomore and fellow computer fanatic from Lakeside High School in Seattle, who had convinced Allen to drop out of college and move to Cambridge. “Hey, this thing is happening without us,” Allen declared. Gates began to rock back and forth, as he often did during moments of intensity. When he finished the article, he realized that Allen was right. For the next eight weeks, the two of them embarked on a frenzy of code writing that would change the nature of the computer business. When he was asked to describe the types of roommates he preferred, Gates asked for an African American and an international student. He was assigned to Wigglesworth Hall with Sam Znaimer, a science geek from a family of poor Jewish refugees in Montreal, and Jim Jenkins, a black student from Chattanooga, Tennessee. Znaimer, who had never known a privileged WASP before, found Gates friendly but weirdly fascinating. He marveled as Gates spent several nights filling out various federal and state tax forms for the revenues of his high school programming firm, and was astounded by the intensity of his study schedule. “His habit was to do 36 hours or more at a stretch, collapse for 10 hours, then go out, get a pizza, and go back at it,” he recalled. “And if that meant he was starting again at 3 in the morning, so be it.” When working hard, Gates would rock back and forth. Then he would grab Znaimer for a frenzy of playing Pong, the Atari video game, in the dorm lounge, or Spacewar!, a legendary game invented at MIT, on one of the mainframes in Harvard’s computer lab. The lab was named after Harvard’s computer science pioneer Howard Aiken, who had invented an electromechanical computer known as the Mark I, which now sits in the lobby of the Science Center. The Aiken Lab housed one of Gates’s favorite machines: a PDP-10 from Digital Equipment Co. It had been destined for use in Vietnam but was reassigned to Harvard to assist military-funded research there. To avoid sparking an antiwar protest, it was smuggled into the lab early one Sunday morning in 1969. There were also a slew of PDP-1 computers on which to play Spacewar! For his freshman computer project, Gates linked the PDP-10 and a PDP-1 to create a video baseball game. “The logic was on the PDP-10, but I sent it down to the PDP-1 because I used the same display as Spacewar!, a line-drawing display which you don’t see anymore,” said Gates. Allen’s warning to Gates that he would not always be the smartest kid in class turned out to be true. There was a freshman who lived upstairs from him in Wigglesworth who was better at math, Andy Braiterman from Baltimore. They would wrestle with Math 55 problem sets all night in Braiterman’s room, eating pizza. “Bill was intense,” Braiterman remembered, both about math and poker. He was also “a good arguer.” Gates was particularly forceful in asserting that soon everyone would have a home computer that could be used for calling up books and other information. He and Braiterman decided to room together, and they were assigned to Currier House, which Gates loved. The chef in our place is sloppy, and when he prepares a stack of pancakes they come out all different sizes. Therefore, when I deliver them to a customer, on the way to the table I rearrange them (so that the smallest winds up on top, and so on, down to the largest at the bottom) by grabbing several from the top and flipping them over, repeating this (varying the number I flip) as many times as necessary. If there are n pancakes, what is the maximum number of flips (as a function f(n) of n) that I will ever have to use to rearrange them? The answer required coming up with a good algorithm, just as any computer program did. “I posed it in class, and then I went on,” Lewis recalled. “And a day or two later, this smart sophomore comes into my office and explains that he’s got a five-thirds N algorithm.” In other words, Gates had figured out a way to do it with five-thirds flips per the number of pancakes in the stack. “It involved a complicated case analysis of what exactly the configuration of the top few pancakes might look like,” Lewis recalled. “It was quite clever.” A teaching assistant in the class, Christos Papadimitriou, later published the solution in a scholarly paper co-authored with Gates. Such was Gates’s life at Harvard when it was suddenly changed, halfway through his sophomore year, by Allen’s arrival at his Currier House room with his newly purchased copy of Popular Electronics featuring the Altair on the cover. Allen’s rallying cry—“Hey, this thing is happening without us”—jolted Gates into action. Gates and Allen set out to write some software that would make it possible for hobbyists to create their own programs on the Altair. Specifically, they decided to write an interpreter for the programming language known as BASIC that would run on the Altair’s Intel 8080 microprocessor. It would become the first commercial native high-level programming language for a microprocessor. In other words, it would launch the personal computer software industry. They wrote a letter to MITS, the fledgling Albuquerque company that made the Altair, claiming that they had created a BASIC language interpreter that could run on the 8080. “We are interested in selling copies of this software to hobbyists through you.” In reality, they did not yet have any software. But they knew they could scramble and write it if MITS expressed interest. When they did not hear back, they decided to call. Gates suggested that Allen place the call, because he was older. “No, you should do it; you’re better at this kind of thing,” Allen argued. They came up with a compromise: Gates would call, disguising his squeaky voice, but he would use the name Paul Allen, because they knew it would be Allen who would fly out to Albuquerque if they got lucky. “I had my beard going and at least looked like an adult, while Bill still could pass for a high school sophomore,” recalled Allen. Because they did not have an Altair to work on, Allen had to emulate one on the PDP-10 mainframe at the Aiken Lab. So they bought a manual for the 8080 microprocessor and within weeks Allen had the simulator and other development tools ready. One night they were having dinner at Currier House, sitting at the table with the other math geeks, and they began complaining about facing the tedious task of writing the floating-point math routines, which would give the program the ability to deal with both very small and very large numbers in scientific notation. A curly-haired kid from Milwaukee named Monte Davidoff piped up, “I’ve written those types of routines.” It was the benefit of being at Harvard. Gates and Allen began peppering him with questions about his capacity to handle floating-point code. Satisfied they knew what he was talking about, they brought him to Gates’s room and negotiated a fee of $400 for his work. He became the third member of the team, and would eventually earn a lot more. They would scribble away at their notepads, competing to see who could execute a subroutine in the fewest lines. “I can do it in nine,” one would shout. Another would shoot back, “Well, I can do it in five!” As Allen noted, “We knew that each byte saved would leave that much more room for users to add to their applications.” The goal was to get the program into less than the 4K of memory that an enhanced Altair would have, so there would be a little room left over for the consumer to use. (A 16GB smartphone has four million times that memory.) At night they would fan out the printouts onto the floor and search for ways to make it more elegant and compact. By late February 1975, after eight weeks of intense coding, they got it down, brilliantly, into 3.2K. “It wasn’t a question of whether I could write the program, but rather a question of whether I could squeeze it into under 4K and make it super fast,” said Gates. “It was the coolest program I ever wrote.” Gates checked it for errors one last time, then commanded the Aiken lab’s PDP-10 to spew out a punch-tape of it so Allen could take it down to Albuquerque. Rogers invited Allen into his office and agreed to license the BASIC interpreter for inclusion on all Altair machines. “I couldn’t stop grinning,” Allen recalled. As soon as he got back to his hotel, Allen called Gates at Harvard. They were officially in business. When Allen arrived back in Cambridge, bringing with him a working Altair to install in Gates’s Currier House room, they went out to celebrate. Gates had his usual, a Shirley Temple: ginger ale with maraschino cherry juice. A month later, Roberts offered Allen a fulltime job at MITS as director of software. Gates decided to stay at Harvard, at least for the time being. There he endured what has become a rite of passage, amusing only in retrospect, for many of Harvard’s most successful students: being hauled before the dreaded and then-secretive Administrative Board for a disciplinary process, known as being “Ad Boarded.” Gates’s case arose when auditors from the Defense Department decided to check the use of the PDP-10 that it was funding in Harvard’s Aiken lab. They discovered that one sophomore—W.H. Gates—was using most of the time. After much fretting, Gates prepared a paper defending himself and describing how he had created a version of BASIC using the PDP-10 as a simulator. He ended up being exonerated for his use of the machine, but he was “admonished” for allowing a non-student, Allen, to log on with his password. He accepted that minor reprimand and agreed to put his early version of the BASIC interpreter (but not the refined one he and Allen were by then working on) into the public domain. 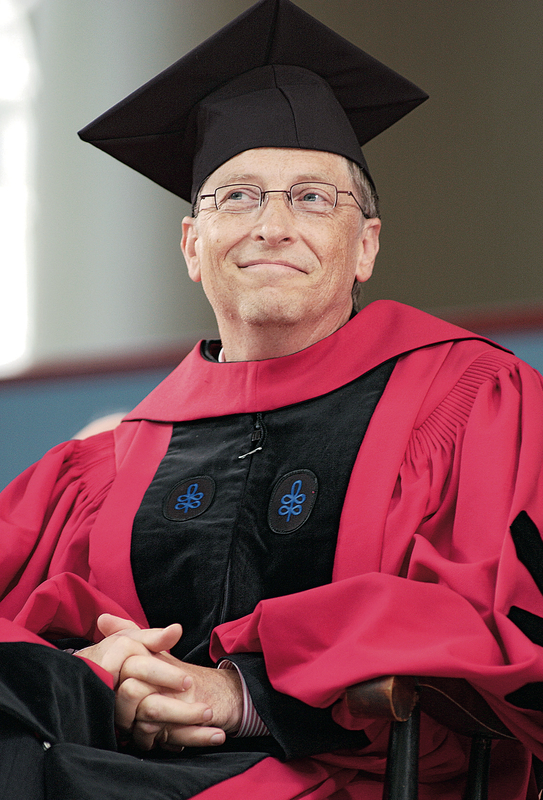 Read Bill Gates's 2007 honorary-degree citation here, and his Commencement address here. His vision of Harvard in 2036, written for Harvard Magazine's issue on the University's 375th anniversary, in 2011, is available here.